Jay Adams is generally known as the Biblical or Nouthetic Counselling author of Competent to Counsel. Yet he would point out also his personal focus and study in the area of preaching. Years of thought in this field went into this accessible book. Still today, a quarter of a century later, it is well worth reading. 22 chapters in 160 pages. The chapters are short and a quick read. However the instruction given is worthy of considered thought and personal reflection. 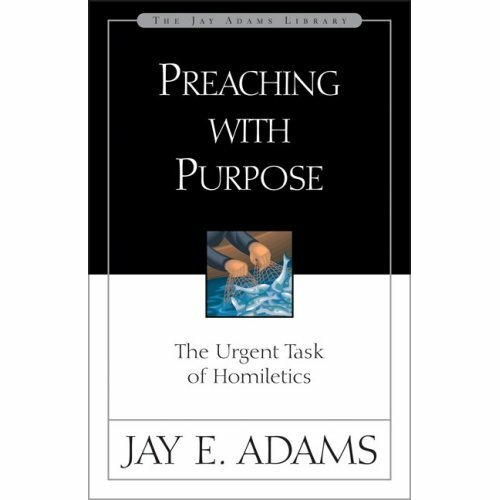 For Adams, preaching should be, must be, a purposeful task. It is not about informing, but motivating and changing listeners as the Word of God is spoken to them. Everything in preaching should be driven by the “telic” concern (the goal/purpose of it all) . . . and that concern drives each element of the book. What is the purpose of the illustration, the introduction, the outline, etc. I have referred to the book several times in the last weeks because I have resonated with so much of what is written. As in most books, there are certain positions taken with which some would disagree (such as the note on the role of the literary structure not being any influence on the sermon structure), but overall this is a little book that packs a punch. If you haven’t read Preaching with Purpose, don’t ignore it because it has been around a while. The content does not feel dated, and the teaching is well worth hearing for those of us that really want to preach for changed lives, rather than just lecturing for informed minds.